Here are links to my demos! Other animation and video game character voices can be available upon request. Please let me know if you have any further questions. I have worked on pre-lay animation projects, and am available for a live-directed session at your request. File Types - MP3, WAV, AIFF, etc. Remember, voice work can come from just about anywhere, including places you'd least expect. Have a great time! Keep plugging away and we'll all make it together! A well put together presentation, generally speaking. I checked out the commercial and animation ones. On the commercial one, the Patreon cut, which you've put last, is actually your best one. My opinion, put that one first. HOWEVER...I might also change that music. It sounds like a Disney mystery movie backing track, rather than one for donating money to artists. At :18 there is a noise, like a click. Possibly a mouth click? If you are using Audacity, I would use the declick feature on that. The first two ads sound like the same read, cadence, attitude. I would choose one or the other. On the animation one, you're pretty good with the characters. However, for a demo, 1:33 is too long. Hit them with the highs, mediums and lows of your range, then bail out. Less is more; leave `em laughing, all that stuff. Also, it doesn't sound like your voice and the backing tracks are emanating from the same place. I suspect you've compressed your vocal without treating the backing track, so the backing sounds thin and too quiet while your voice is too far out front. You need to EQ and blend them so they sound like they belong together, not like you're talking over a stereo. Your website is simple and effective. "Places I've Been" could be removed, though. A buyer may not care where you've been. You have your act together more than many people, though. Thanks for the feedback! I've actually updated my website and changed the url. 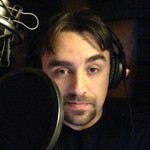 It is now www.codyrockvoiceover.com. I'll take the rest into consideration. Thanks again! Me again. Move the demos up next to your picture, and the "About Cody" below that. Actually go top to bottom: Pic/demos, testimonials, About Cody. Thanks for taking the time to look over my website! Please forgive the late reply. This summer has been pretty hectic, but I greatly appreciate the feedback. I'll be taking it into consideration. Another day, another few auditions. Thanks to all who checked out my demos and website so far! It's greatly appreciated. Have an awesome day everyone! Hi everyone! I truly hope everyone is having a great day! Wishing you the best in your VO endeavors! Been a little while since I've logged in, but I'm still available for projects. Please let me know how I can serve your needs as a professional voiceover talent! Check out my website for demos and and updated client list. Have a great day everybody! Hi there everyone! I hope the start of 2019 has treated you well! Please let me know if I can help in any way, VO-wise. Hey everyone! I hope the start of spring has been good for you! Please let me know if you need me for any VO-related needs!